Whether you love to catch fish, eat fish, tell big fish tales at the bar, or all three, Ocean Isle Fish Company is the place you want to be. Offering the freshest local seafood in a super-casual waterfront atmosphere (shorts and flip flops allowed! ), Ocean Isle Fish Company is the ultimate three-in-one fish house. Dine on the freshest seafood in town, or tip a few at the Tiki Bar, where you will find fun specialty cocktails such as the Tiki Parrot, Banana Hammock, or High Tide, all of which are served in a hand-carved Pirate Coconut that you can bring home as a souvenir. If you really want to dive in at the bar, try the Jolly Mon, Oceanrita, or Beachy Mama, all served in a 64-ounce fishbowl that you can keep. Not only is OIFC an excellent open-air Ocean Isle seafood restaurant and rollicking fun cocktail bar, they also boast a sushi bar, a top-notch tackle shop, watercraft rentals, and charter fishing. For the kids, OIFC’s Treasure Island offers tons of fun with Treasure Island characters and sand sifting for shells, fossils, and hidden treasures. Each day area fishermen bring their catch right to OIFC’s docks, making for a true ocean-to-table dining experience. But dining on the freshest fish on the Brunswick County coast doesn’t mean cleaning out your wallet. OIFC is one of our favorite Ocean Isle seafood restaurants because not only is the food incredible, but so are the prices. Prices range from $5 to about $20. Feast on made-from-scratch soup of the day, followed by unique salads such as Asian Yellowfin Salad or Coconut Shrimp Salad. Get your appetite ready for the main course with appetizers like Hurricane Shrimp, Calypso Calamari, Mozzarella Sticks, or Lobster and Shrimp Nachos. OIFC features a mouthwatering array of creative entrees such as Yellowfin Fusion Tacos, Sweet Basted Shrimp Kabobs, Seafood Scampi Pasta, and a number of delectable steak and chicken dishes. If you really want a taste of local flavor, check out their Low Country Boil, a fantastic concoction of beer-boiled shrimp, mussels, clams, kielbasa sausage, red potatoes and corn on the cob served with garlic bread and cocktail sauce. 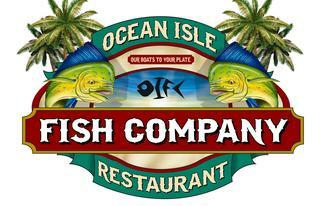 Ocean Isle Fish Company Restaurant in Ocean Isle Beach is located just a short jaunt from the Ocean Isle Beach shore. From the beach, go to the roundabout at Causeway Drive (Highway 904) and head inland. Cross over 2nd and 3rd Streets. Less than a quarter mile after 3rd Street you’ll see Ocean Isle Fish Company on the right side after Sharky’s.